Are you an undergraduate student currently pursuing a degree in Science, Technology, Engineering or Math (STEM) with very limited opportunities at your current academic institution to learn about graduate school opportunities and/or to obtain the necessary research experience for graduate school? If so, consider becoming a Trekker! We are recruiting 1st and 2nd year students. Prior research experience is welcome, but not required. i-Trek offers two programs each year. The first program is a one week research team tryout. The second is a follow-on program, for selected students, aimed at providing students with invaluable research skills through a one year, team research project. To be considered for the follow-on research program, successful completion of the tryout is required. Our research team tryouts takes place in the Boston area and features many fun and informative activities including tours of top graduate schools, talks by current graduate students, meet and greet sessions with administrators and skill building activities helpful for the graduate school application process. Students that are admitted into this program are provided transportation and housing and are expected to complete the scheduled activities during this one week period. Curious what it is like to participate in the tryouts? Read about past participants experiences or sign up for a virtual info session. Do you have a research idea you’d like to see materialize? Would you like to travel to do it? Apply to be a Trekker. Trekkers are responsible for bringing to life their research ideas (Treks) with the help of mentor(s) and the Trek committee. 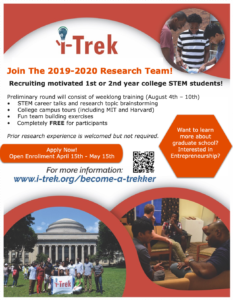 All Trek teams are paired with mentors experienced in the field of your research to help guide you through the process of funding, planning, and executing your idea. After completion of the research team tryouts, selected Trek team members (Trekkers) work together virtually during the school year to review academic literature and discuss experimental ideas. The students reconvene the following summer for data collection, analysis and documentation at a field location relevant to the selected research project. All Treks occur over a few weeks during the summer break, therefore, students need to be available during this period. Want more information about Treks? Check out Past Treks and 2015 Orientation. Trekkers can submit applications by midnight May 15th, 2019.